To this day in fly fishing there is probably an un-recordable amount of fly variations on this prince pattern, and the rabid prince is just one of these variations that has worked for me on many different occasions. Maybe it is the shiny bead-head that draws the attention of fish or possibly it is the sets of forked biots but something is able to get fish to bite and bite hard. Give it a try. 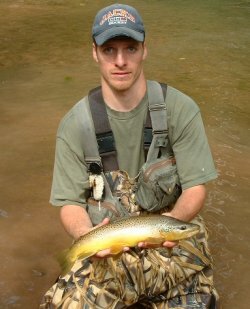 Author with brown trout caught on rabid prince fly pattern. It is no mystery to fly anglers that nymphs catch trout, and lots of them. A trout's diet is approximately 90 percent aquatic invertebrates; so targeting these little critters is definitely to ones advantage. The nymph is a fly pattern that represents insects that are still in their underwater life stage. This stage of life for the insects (juvenile stage) is perhaps the most inviting for fish, because most nymphs are not good swimmers and have the daunting task of getting from the river bottom to the surface to complete their life-cycle. Nymph fishing is by far one of the most effective ways for anglers to contact all species of freshwater fish. In rivers, streams, or lakes, nymphs can be used to catch fish in any part of the water column. They can be fished from the surface film to imitate adult emergers and stillborn flies, yet they can also roll along the bottom depths imitating unhatched larvae. All that is needed to fish these patterns in multiple zones is just a few wraps of lead-free weight or tacking on some split shots. The Prince nymph is just one of the many nymph patterns that fly anglers use to catch trout, but it should be noted that this particular nymph pattern has caught fish all over the world and is regarded as one of the top ten nymphs of all time. The Prince style nymph was originated by the Olson brothers of Bemidji, Minnesota but it became a legendary fish catcher under the skilled hands of Doug Prince in western North America. To this day in fly fishing there is probably an un-recordable amount of fly variations on this prince pattern, and the rabid prince is just one of these variations that has worked for me on many different occasions. Maybe it is the shiny bead-head that draws the attention of fish or possibly it is the sets of forked biots but something is able to get fish to bite and bite hard. To fish this pattern there is no real difference from fishing any other nymph fly. Fish the fly along the bottom slowly, trying to keep your drift as drag free as possible. A good idea is to dart the fly forward from time to time. This action simulates a nymph trying to escape being eaten or a nymph that has been swept off the bottom and trying to get back to the safety of the river bottom. These quick movements coupled with drag free bottom bouncing may help to get weary fish to take your fly when all others are being passed up. 1. Start this fly by slipping the bead over the hook point (small bored out hole first) and advancing it to the back of the hook eye. Place the hook into your vise and secure it so that it does not move around when you are tying in materials. Take a few turns of lead free weight behind the bead and clip the tag end short and press it onto the hook shank. Slide the lead free weight up into the large bored out hole in the back of the bead and tie it down with thread. It is a good idea to place a drop or two of head cement onto the weight just to keep it in place when tying in materials. 2. Select a small patch of hare's ear fur with the guard hairs intact and place it into your hair stacker. After the fur's tips are evened out tie it down to the hook shank leaving about five millimeters extending off the back of the fly. 3. On top of this small patch of hares ear fur tie in two black goose biots that extend just a tad farther out then the hares ear tail. Make sure that when you are tying down the biots that they stay angled outwards. 4. For the body of the fly pinch dub your thread with hare's ears dubbing. Make sure that you add plenty of dubbing wax to your thread and keep the dubbing rope nice and tight. Dub the body of the fly with a slight taper towards the front of the hook. 5. When you are happy with the size and taper of the body select two large white goose biots and tie them on top of the back of the fly just behind the bead head. The biots should follow the traditional V shape wing of the Prince Nymph pattern, extending to just about where the body of the fly starts. Place a drop of head cement onto the tie down point so that the wings will not pull off the fly through heavy usage. 6. With the wings tied down, form a small dubbing loop and get your dubbing tool into position. Select two small one-inch dense clumps of fur, one from a tan zonker strip first and then another from a dark brown strip. Spin the tan fur first in the dubbing loop and wrap the fur hackle twice behind the bead and tie it off. Trim the excess fur hackle and form a second loop and spin the dark brown fur. Take one and a half turns with the dark brown fur hackle and tie it off and trim. The tag end of the fur hackle should get tucked up nicely under the bead head. Don't worry that the fur hackle is a little out of shape at this point, you just added a lot of fur at once time to the collar of the fly so it might be a little unruly to start with. 7. Stroke the zonker fur backwards slowly training it to sit with a swept look to it (a little water on the fingers helps accomplish this a lot quicker). Once you are happy with the look of the collar take a few wraps of threads to hold everything in place. You can now whip finish and trim the excess thread short. Cement the head, but be careful not to glue down any of the fur hackle collar you just created.